We arrived in Zimbabwe after a series of three flights, taking us from Amsterdam to Paris, then to Johannesburg (South Africa). 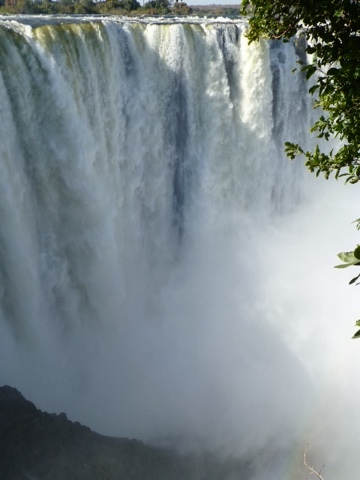 From there we flew an aging Boeing 737 to Victoria Falls. It took another half hour taxi ride to get to our Safari Lodge. Twenty one hours later we settled into our room. 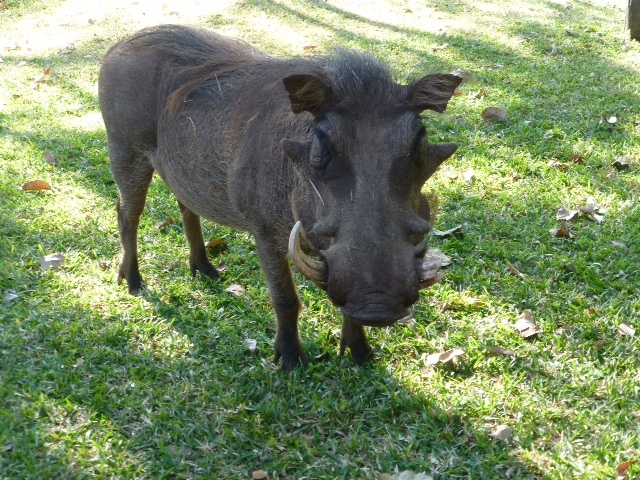 We were soon greeted by a family of warthogs. The hotel calls them nature's lawn mowers. 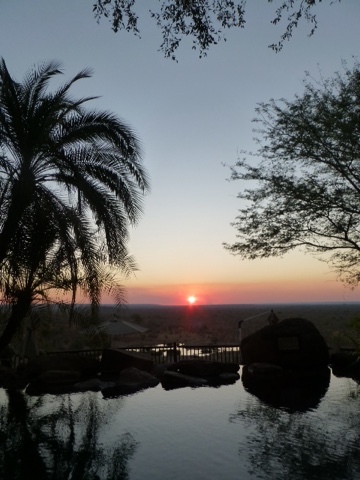 The hotel's restaurant had a view of a watering hole that attracted all sorts of animals, large and small. A pretty large herd of elephants came by to get water, water buffalo, gazelles and guinea foul also came by. 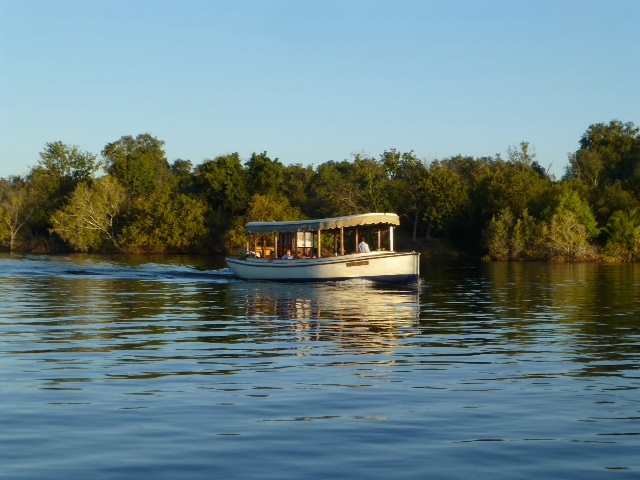 On one of the evenings we took a boat ride on the Zambize River (not on the African Queen-like boat shown below, but a more modern version). The skipper was quite adept at spotting wildlife that was ashore. 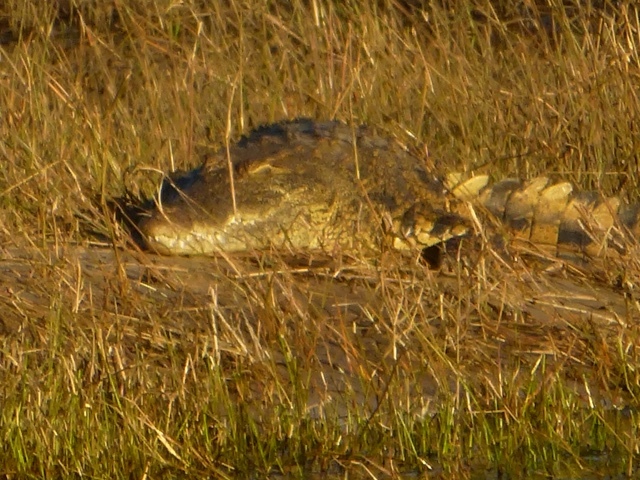 A crocodile lounging in the last bit of sun for the day. 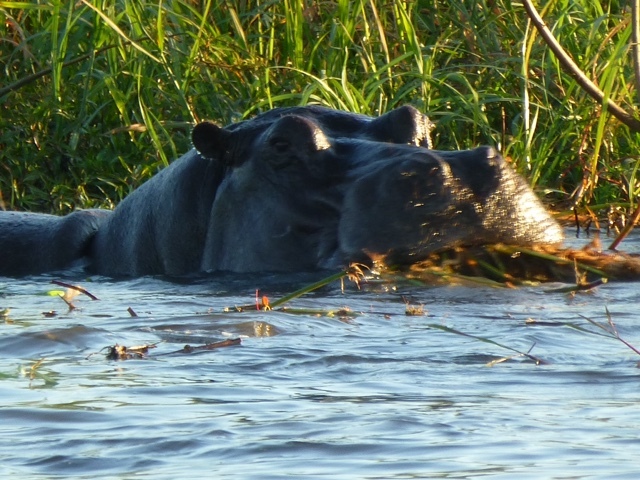 There were lots of hippo pods dinning on the vegetation near the shoreline. 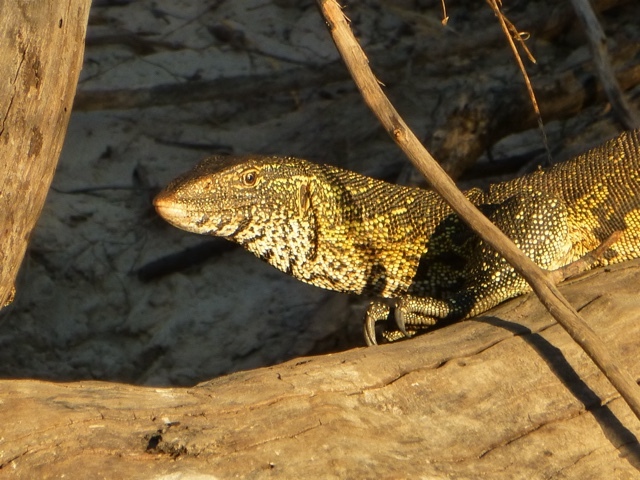 A couple of iguanas were spotted on a tree limb along the shore enjoying the sun. 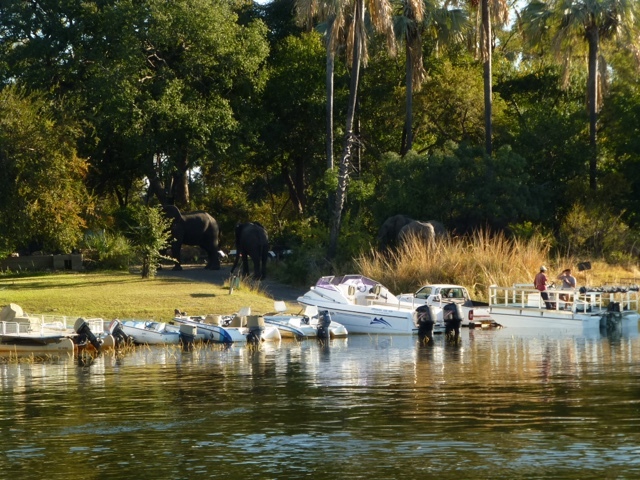 Small elephant heard is visible in the background right along this small marina. 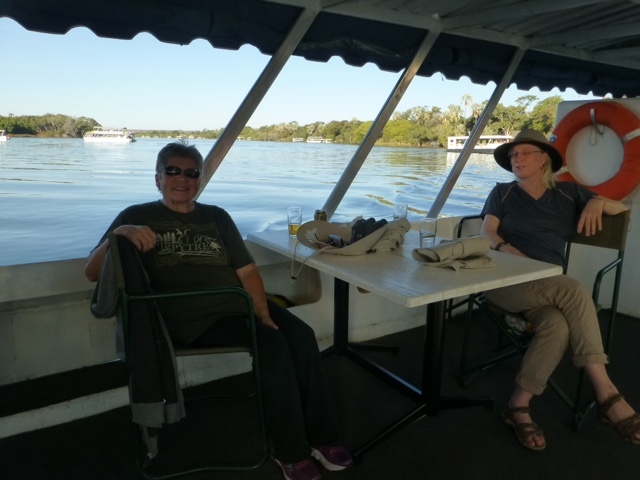 Diane and Linda on the river boat. 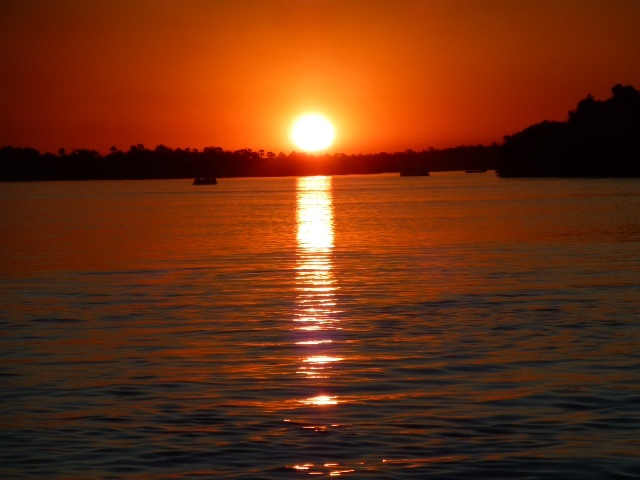 Sunset on the Zambezi was quite special. 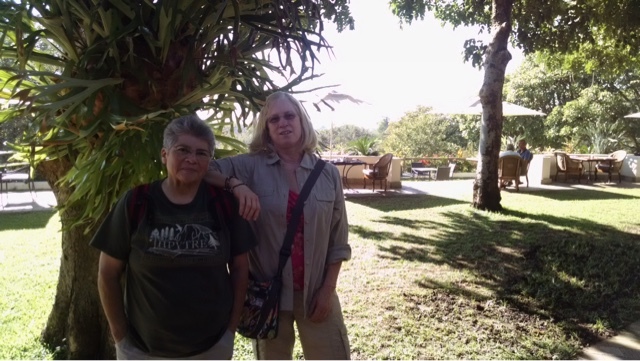 Linda and Diane on the grounds of the Alili Lodge. The grounds of the old Victoria Hotel, built in 1904 display the elegance of a bygone era. 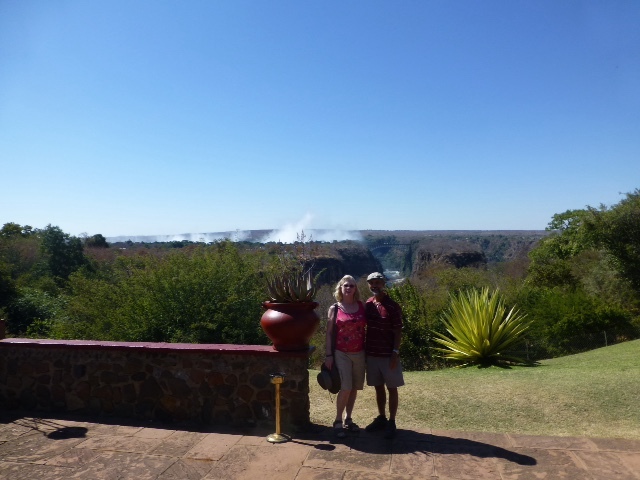 You can spot the mist generated from Victoria Falls in the background. 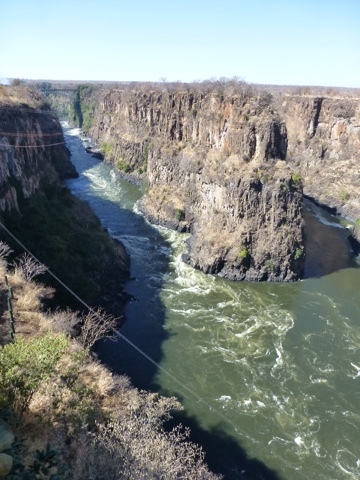 The View Point Cafe had an outstanding view of the Zambezi River. Adjacent to it, they offered zip lining across the river. 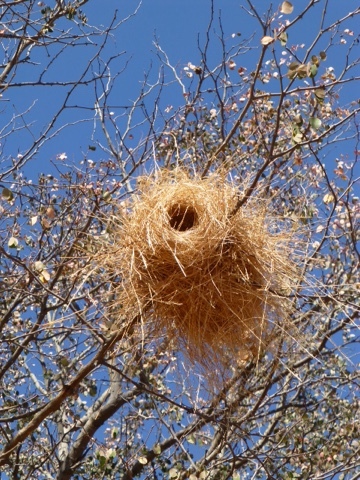 Peculiar little birds create these nests in the trees. From far away, the nests on the trees look a bit scruffy - not unlike something you'd think Dr. Seuss would make up. 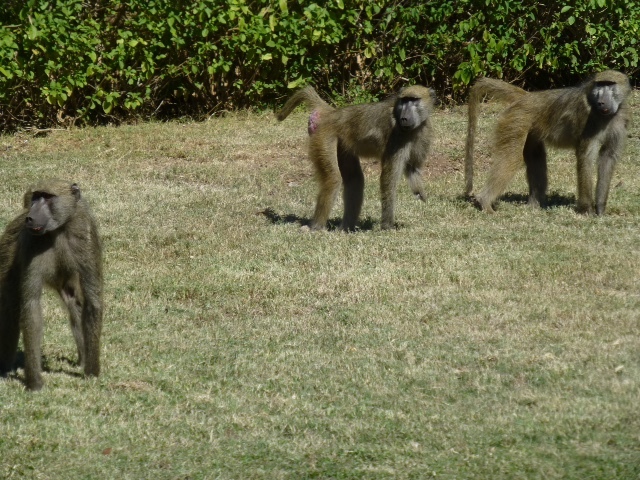 Walking along the streets, you run into all sorts of wild life, including monkeys, warthogs, elephants, baboons, mongoose and more. 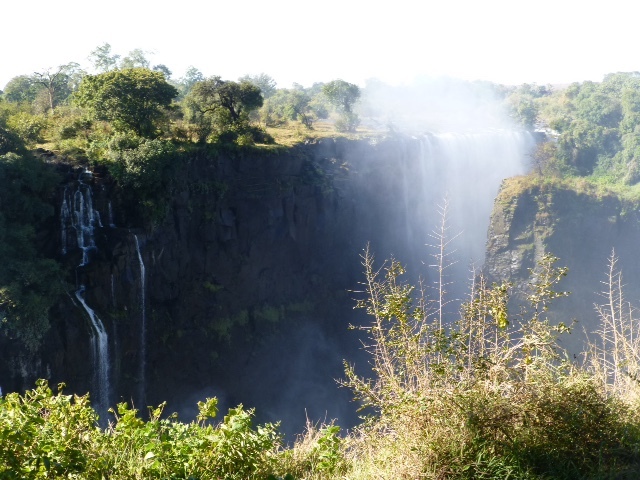 The highlight of our stay was, of course, the Victoria Falls. 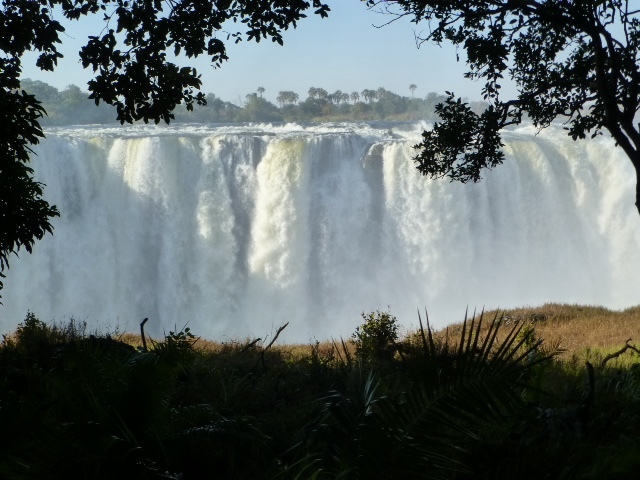 A short walk from our lodge, the falls are utterly majestic and breath-taking. The noise from the falls is easily heard the lodge. They sell cheap ponchos at the entrance to keep you dry because at some of the viewing spots it feels like it's raining hard. 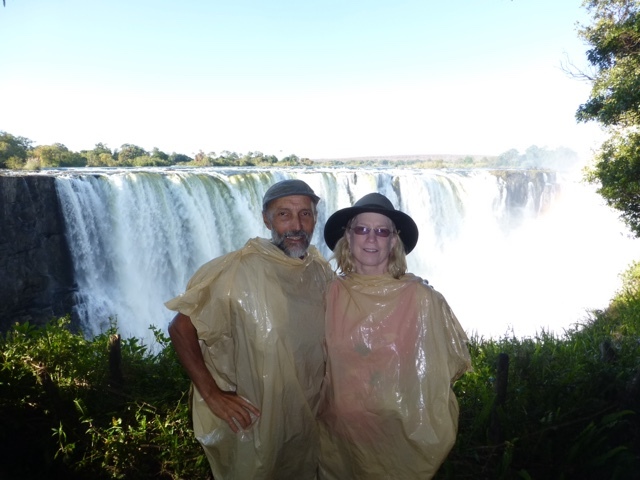 The falls change during the seasons, in that during the rainy season, some of the viewing areas are so wet that it obscures the viewing. 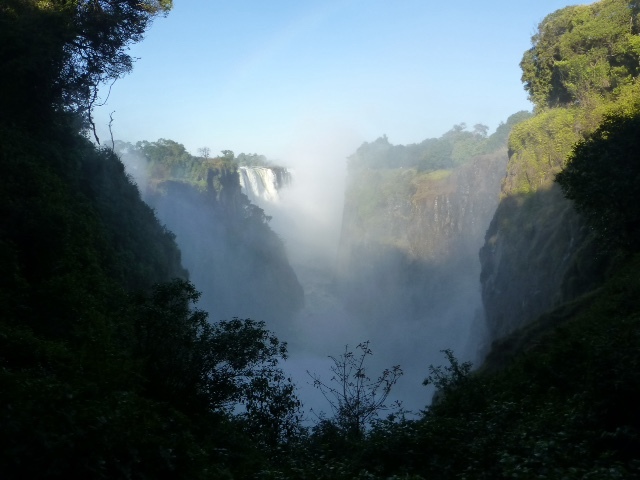 But in the dry season, with a lower water flow, the viewing of the falls can actually be better. Here we are in our chic ponchos. 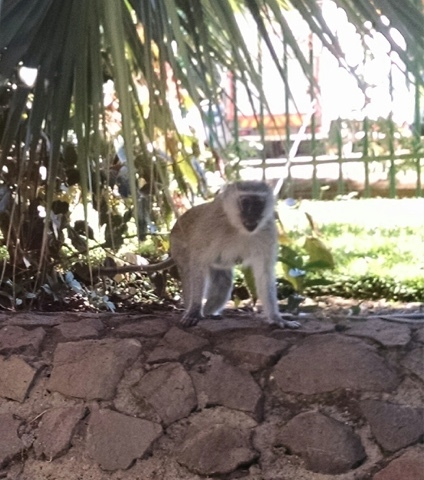 On of the monkeys that hangs around the lodge. Cute as he looks, he became quite aggressive, when I tried to approach him. In the later afternoon we walked to the Lokuthula Lodge to have a beer in their bar. 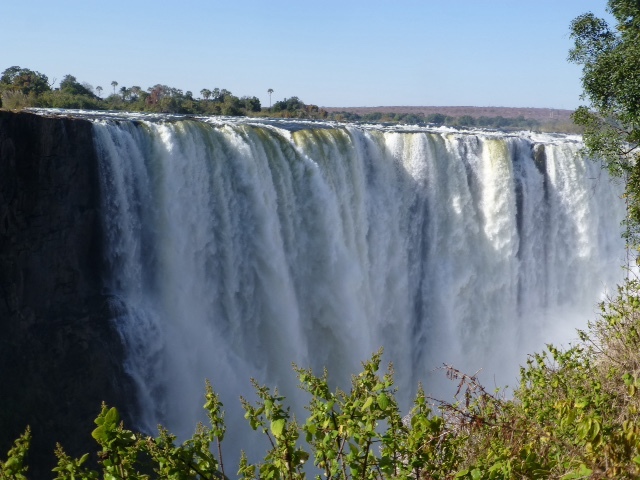 Famous for having a great view of a watering hole that attracts large wild animals, it seemed like the perfect spot to enjoy a Zimbabwe beer. Vultures, a type of stork, a squatty turkey size bird, while we had a beer. Later, at dinner, we large heard of elephants showed up and a lone water buffalo.